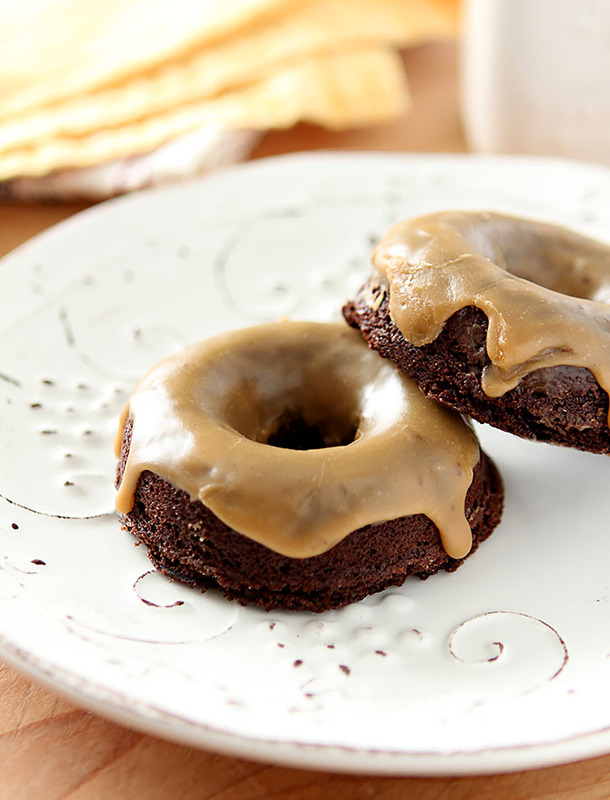 Baileys Salted Caramel and Espresso Baked Doughnuts are easy to make and will quickly disappear! 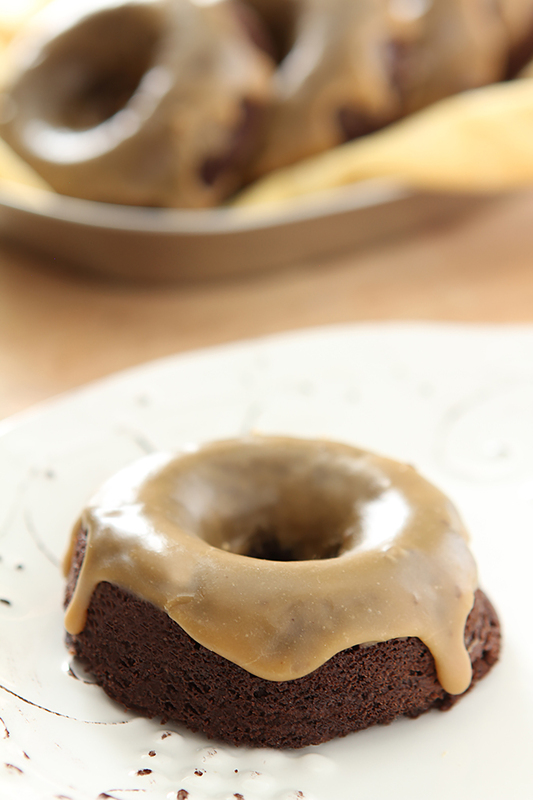 The combination of a chocolate espresso doughnut with an icing made with Baileys is a most decadent way to the start of your day. Please don’t yell. I know, I know; it’s cocktail day. But I was stuck in the middle of a dilemma. Where you are it might be sunny and bright and you’re seeing the bounty and beauty of spring. Where I am? Well, yesterday when I started thinking about a cocktail for today, it was snowing. Yep. It sure was. Inches of the white stuff. And it was really coming down too; not just an end of season fizzle but a full blown, huge snowflakes, had to get out the snowblower snow. So I hope you understand that I could just not get in the mood for a festive, fruity cocktail that would thrill you while also knowing that one that would warm my tummy would fall flat in Georgia so I went a different route. My new toy; a doughnut pan, combined with a new bottle of Baileys Salted Caramel Liqueur were my inspiration and while I first thought of making a coffee based cocktail with the liqueur I have to say that the resulting Baileys Salted Caramel and Espresso Baked Doughnuts are even better. Almost too good to be called breakfast, we had them for dessert! I’ve got more plans for this liqueur too. I’ve always loved Baileys but this flavor? Some may say that salted caramel is a fad and I say, ‘NEVER!’ I love it; I’ve already got a cocktail in mind so stay tuned, there will be more. Have your bottle ready! I’m so not one to jump on a bandwagon but this little doughnut pan contraption has me hook, line and sinker. They are so easy, everything is mixed in a bowl and then piped into the pan. Twelve minutes max; a bit of time to cool and glaze and you’ve got fresh from the oven doughnuts. One basic mix and some slight variation in flavors and I’ve now made three kinds in as many weeks and we’ve loved them all. Consensus is that these Baileys Salted Caramel and Espresso Baked Doughnuts are the favorites so far but it sure is fun playing with new flavors. Next on my agenda? I’m going to try adding bit of yeast and see what happens, knowing of course that baked doughnuts will never replace a fresh from the fryer glazed doughnut. Still, when I can mix and bake doughnuts quicker than I could make the half hour round trip to buy some…these are not going away. Nope…you can expect to see a regular stream of recipes from my latest fascination. And sure…next week I promise the booze will be in a glass! 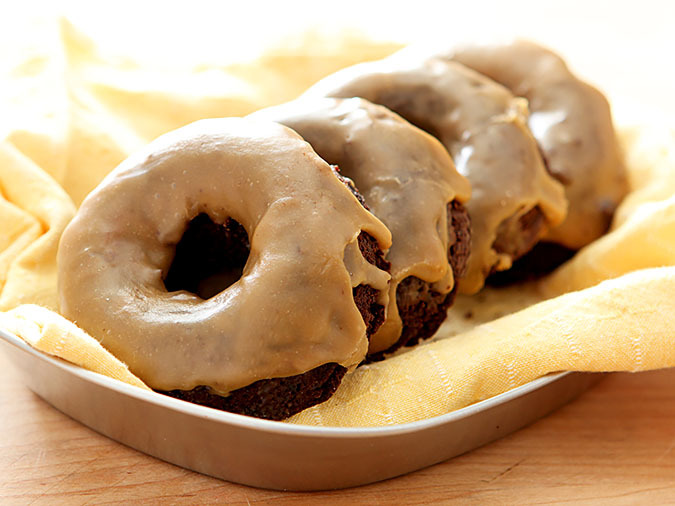 Heat oven to 325 F. Coat a doughnut pan with non-stick cooking spray & set aside. Whisk flour, cocoa, baking soda, espresso powder and salt in a large bowl. In a smaller bowl, whisk together buttermilk, Baileys, sugar, egg, oil and vanilla until smooth. Add the milk mixture to the flour mixture and whisk until well blended. Spoon the batter into a piping bag or a large resealable plastic bag. Cut the end or the corner and squeeze batter into prepared doughnut pan about 2/3 full. Bake for 10-12 minutes, until doughnuts spring back when lightly pressed. Cool in pan on rack for 3 minutes, then carefully turn out directly onto rack to cool. Melt butter in a medium size pan over medium heat; once melted add the water, espresso and vanilla and whisk until combined. Slowly combine confectioner's sugar, adding the Baileys to thin out glaze. If the consistency is too thin, add a bit more sugar. If too thick add a bit more liqueur. Dip doughnut tops in glaze and put on a rack to allow it to dry and slightly harden. In the glaze, the measurements for the water and the espresso are not included. Could you please add them to the recipe? Thank you! Yikes…how in the heck did that happen? I’ve made that correction…thanks for being patient! Ohhhh mah gawd!! Yes, we’re yelling…please don’t stop :)) Is the snow ever going to stop?! I hope so. We can’t plant til 5/15 so yes we could still get some up til then. HURRY SUMMER! Deadly accurate answer. You’ve hit the buleylse!